You can brighten up your wall while making a real contribution to student's lives with our special Spring Up Calendar. Twelve months means twelve delicious easy to make recipes to bring the kitchen alive as well as tantalise the taste buds! Many of these fantastic recipes and the stunning images that accompany them were collected during Spring Up Foundation's sponsored walk from Jenin to Jericho in April 2018 - our first fundraising event. 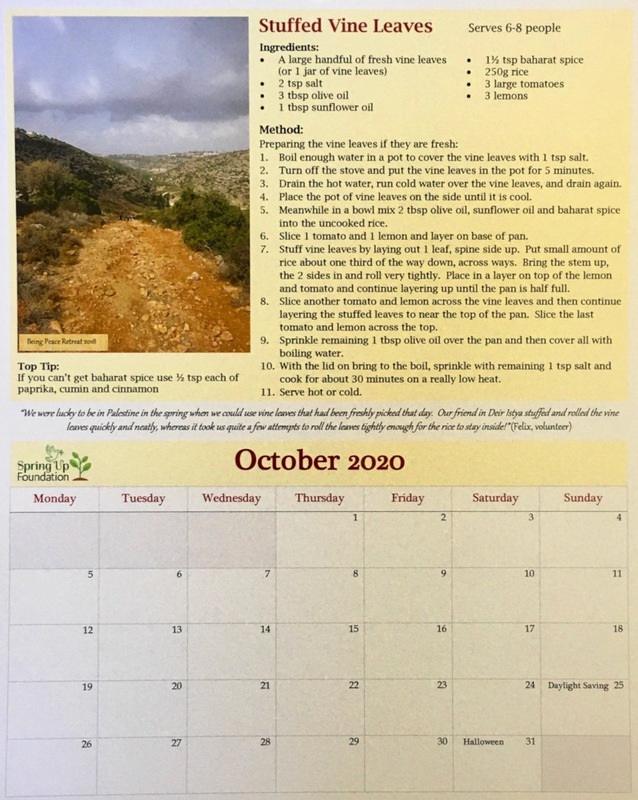 The calendar is a great way to support our work, and a perfect way to invite the warmth, beauty, and creativity of Palestinian flavours into your life. As always we have kept our costs to a minimum to allow the most money to reach the students, yet we've also ensured this calendar is a beautiful quality product, so you'll both get something meaningful to bring happiness and ease. Each month has a tasty Palestinian recipe with a narrative from the recipe provider and a photo taken in Palestine. All the profits from the sale of these calendars go towards higher education scholarships for young Palestinians who may not otherwise be able to afford university fees. If you're outside of the UK and would like a calendar sent to you please contact us.